The Raritan Dominion DSXB-8-DC is a Single-feed DC power (-36-72V) 8-port secure console server includes 2 console ports. Please note: there is a 20 unit minimum for the DC powered models. Dominion DSXB-8-DC is a secure console server for local and remote access to serially managed servers and other serial devices via SSH/Telnet and Web browser. 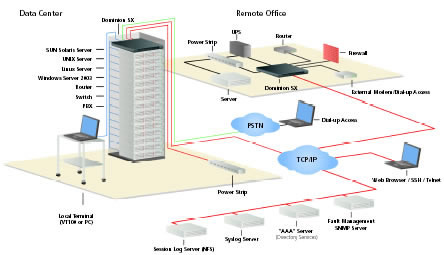 The Dominion SX model allows access and control of up to 8 devices including: servers, routers, switches, VPNs and power strips. It can scale across hundreds of users and thousands of devices, highly secure, easy to install and simple to use. Answer: Thank you for your inquiry. We don not believe a user can switch out the power supplies on these units, but there is n 8-port AC model with two console ports, the DSX8, which can be located here: https://www.kvm-switches-online.com/dsx8.html.